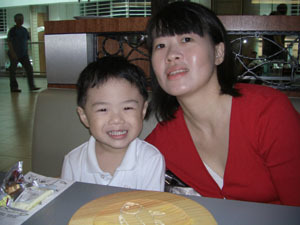 At long last, this is our next trip with our boy, Aiken (He is coming to 3 years old this Oct 2007). We decided to go to somewhere nearby to relax. Decided to go Nothern Thailand, Chiangmai where the pace is slower compared to Bangkok and more relaxed. 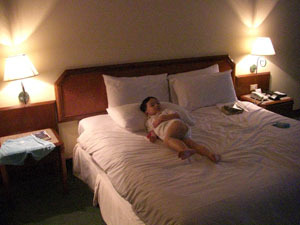 Not only that, it is also quite cheap and value for money, only about SGD1100 for 3 pax (4D3N). Arrived at the airport 2hrs earlier at 1230h to check in our luggage and stuff. As we did not have our lunch, decided to drop by Fish & Co for our meal. A much better decision than eating at the "food court" @ T1, 2 years back when we went KL. Aiken was very excited about taking the plane. 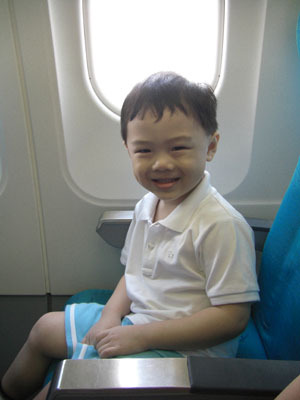 Along the way to the plane, he keep saying, "Aiken sit aeroplane!!! Hurray!!!" 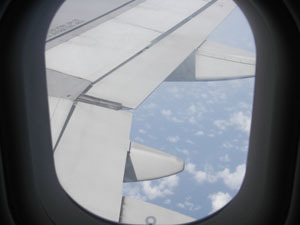 View out of the plane...always love to take these pics. Reached Chiangmai Airport at about 1700h (CNX TIME), Chiangmai is about 1hr behind SIN. For those going to Chiangmai, use the airport taxi instead of those who wait for passengers at the arrival hall. You only pay about 120 baht for a one-way trip from the airport to the hotel (city area). Reach the hotel about 1730h and we are staying at the Central Duangtawan Hotel (Rm 9003) which is located just beside the Kalare Night Bazaar. Here's my boy enjoying himself on the bed. 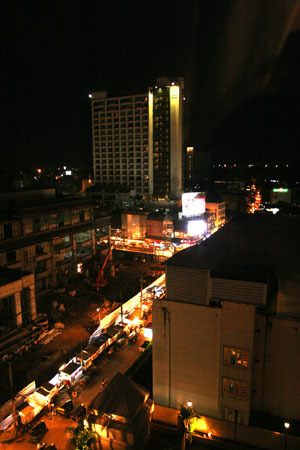 This is the view from our hotel room, not really much of a view though...haha..
Notice the row of stalls at the roadside? That's the bazaar, it really does stretch a long long way along the road. Decided to go for a walk along the bazaar. The amazing thing about these stalls is that they only setup at about 1800h in the evening and operates till midnight. By the next day morning, all these stalls are removed and "installed" back in the following evening. 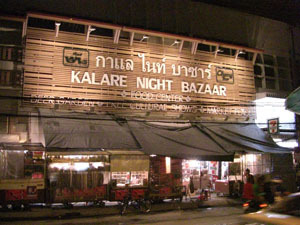 We found a "foodcourt" at the Kalare Night Bazaar where the food looks quite good. You will have to buy coupons before buying any food from the stalls. 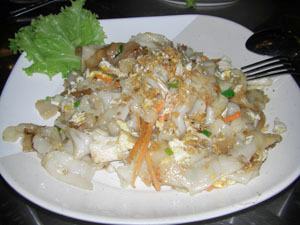 This is what both me and my wife got, Thai style Fried Kway Teow with Chicken & Egg. Don't look much but it is quite tasty. Walked a bit more around the bazaar and we retired to the hotel at about 2145h.